Fixed a bug with parseInt()'s usage. Events wouldn't load correctly for the 8th or 9th of a month. Be sure to grab an updated stylesheet too! 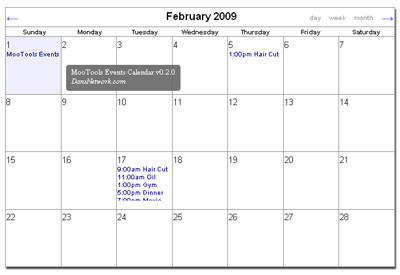 Feb 01, 2009 - MooTools Events Calendar v0.2.0 is released! Special thanks to Brandon Booth from LucidGreen! We're getting closer to the next release (v0.2.0). There are some big changes, mainly to ease event loading. Check out weekly/biweekly builds here. I've successfully implemented the Google Calendar Feed utilizing the Gdata Zend Framework and some PHP. It actually works really well with FF and Safari, but our IE friend doesn't want to cooperate. It works with IE, but is terribly slow when switching views. I'm currently working on a solution. If anyone would like to help, please feel free to contact me.